Oh hello there! It's been a while! A lot has happened since last time I wrote. We're back on US soil, grateful for our ridiculously amazing time abroad but so happy to be home. It turns out that I had a kitchen of my own again just in time to make a grand dessert feast for Andy's 30th birthday this weekend. We had a combined birthday/housewarming celebration and I obviously couldn't pass up the opportunity to shove sweets down peoples' throats. I made several desserts, but these Mini Cherry Pies definitely took home the prize for cute factor. 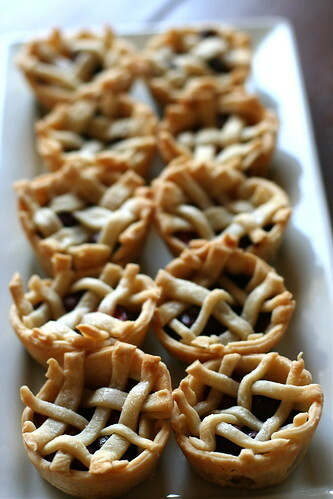 I got the mini pie idea from Jenny at Picky Palate and put my own spin on the filling. These little babies are a slightly tedious (no surprise there), but completely worth it. Not only were they tasty, the adorableness factor garnered them high praise at the party. There's no recipe for this, really. Use your favorite pie filling (I improvised one using fresh pitted cherries, sugar, lemon juice, cinnamon, and flour) and Jenny's incredibly helpful and thorough photo tutorial for the crust and baking guidelines. I increased the recipe a bit and wound up with 12 pies. Have fun! Yay! Amy I. is back with sweet desserts to make my mouth water! oh-so-cute!! :) I just might have to try this! :) Glad to see you're back. Hooray! I'm so happy that you're back!!!!! Nice post! Small and delicious! Welcome I wish all the recipes you wanted to do to do it and I hope we can all see them! Totally cute and so happy to see you back! What a super yummy post! So cute too! Chery pie, it sounds exactly for me. I love cherries in any form, plain, in desserts even with cheese.